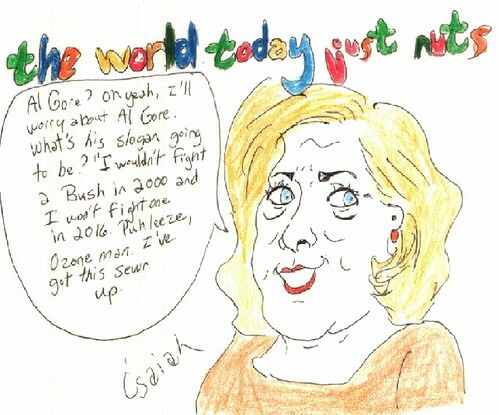 The Common Ills: Isaiah's The World Today Just Nuts "Hillary Responds To Rumors"
Isaiah's The World Today Just Nuts "Hillary Responds To Rumors"
Isaiah's latest The World Today Just Nuts "Hillary Responds To Rumors." Hillary Clinton declares, "Al Gore? Oh yeah, I'll worry about Al Gore. What's his slogan going to be? 'I wouldn't fight a Bush in 2000 and I won't fight one in 2016.' Puhleaze, Ozone man, I've got this sewn up." Isaiah archives his comics at The World Today Just Nuts.